The Beacon Academy is a learning community that offers students from all backgrounds the opportunity to receive and succeed in a unique, holistic and globally recognized education that allows them to enter a local or international college or university best fit for their talents and who will, in the future, make a positive contribution to the country. The Beacon Academy is founded to be an exemplary Filipino school—faithful to its mission, of consequence to the country, and relevant internationally. The Beacon Academy’s logo is an embodiment of the concepts of “zero” and “infinity.” Zero, “discovered” by Hindu Academics, ushered in a new age in mathematics and allowed for the idea of creating value from nothing. Infinity, on the other hand, suggests limitless possibilities or solutions. These concepts are expressed graphically in the form of a Mobius strip, implying a journey along a defined and retraceable path — knowledge, experiences, and values that are constantly revisited, traveled upon, and reaffirmed. As a whole, the logo stands for an education that builds upon solid foundations for growth but demands the exploration of possibility — one that embraces fluidity but is rooted in an integral, enduring core. The Academy colors — Green and Blue — are a reminder of the context in which education takes place: these are the colors of the earth. They are also representative of the values and the dualities that the Academy aspires to address: humanity and spirituality, our nation and its role within the global community, the careful balance between nature and human endeavor, hope and integrity. “Virtus et Ars” - Virtue (Goodness) and Applied Knowledge, or more simply, “Goodness and knowledge.” These words express the core mission of the Academy. All together, the logo, colors and motto define what the Academy is about: providing an outstanding education that encourages and enables its graduates, acting with goodness, integrity, and understanding, to change their world for the better.In order to fulfill its mission and deliver an assurance of a global education of the highest quality to all of its students, the Beacon Academy works with the International Baccalaureate Organization to deliver the IB Middle Years Programme in grades 9 and 10, and the Diploma Programme in grades 11 and 12. 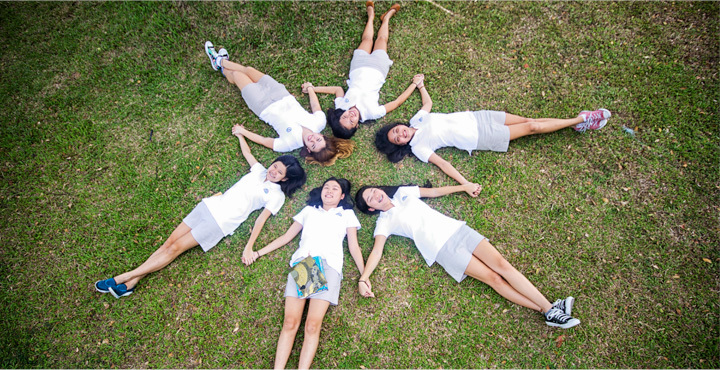 The Academy offers a complete high school program as an IB World School. These are schools that share a common philosophy — a commitment to high quality, challenging, international education that Beacon believes is important for its students. Click on the video to learn what our students have to say about studying at The Beacon Academy.